This is kind of a weird poster. Here we have our favorite heroes running either towards or from some unseen something, being shown from sort of a strange angle. And the robots look uncharacteristically cartoonish, considering how much of this series has been based around showing what these giant creatures might look like in real life. As a matter of fact this poster reminds me a lot of a promotional picture or scene from an 80’s cartoon. I’m not sure if my memory is responding to some specific image from my childhood or to a pattern I noticed only subconsciously. In fact, I can’t explain this feeling at all. But it is there. And what, exactly, are those flashes of light coming from behind them? An explosion? Killer laser beams? Something else entirely? I have stared and stared, but I’m still not sure. Just to finish, I find it interesting that all the posters for the second go around of Transformers haven’t featured any of the original good robots except Bumblebee and Optimus. A little while ago I saw an interview by someone related to the film (Michael Bay maybe?) where he explained that they wanted to get more robots in, but ultimately couldn’t afford it. This seems like a good thing on hindsight, since only two of the various Transformers turned out be really memorable anyway. 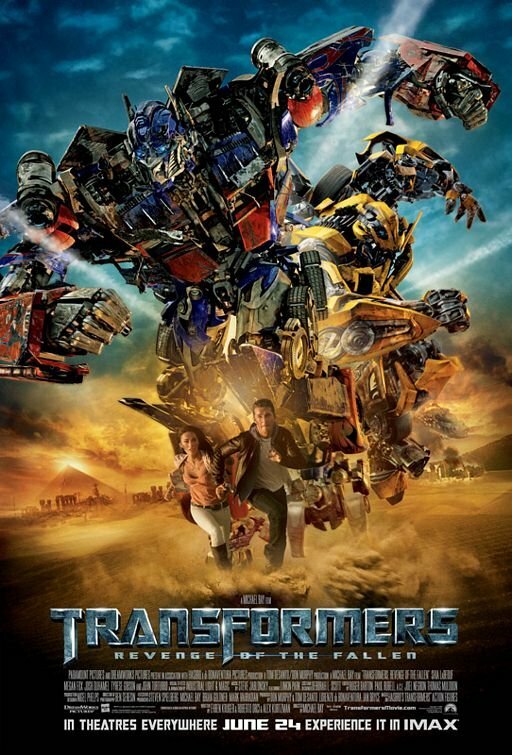 i found most of the TRANSFORMERS posters (and action movie posters in general) lacking in motion. usually it’s just people looking cool. i have to give them credit for that but they’ve also used one of my most-hated comic book cliches which is a group of people running toward the camera. hate that.